Scott Brown's only goal of the game at home to Cowdenbeath was enough to move Peterhead to the top of League Two. The Blue Toon move two points above Edinburgh City - as they made full use of their game in hand. David Goodwillie winner away to Stirling Albion moves Clyde to within two points of Edinburgh. Annan Athletic move eight points clear in fourth place after their win away to Berwick Rangers as Elgin City were held at home to Queen's Park. 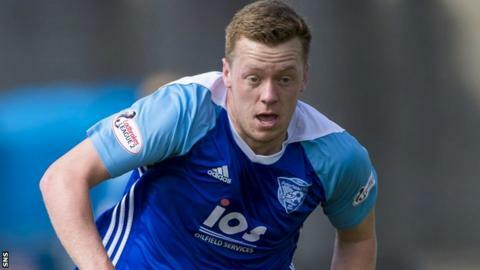 Peterhead's top scorer Rory McAllister turned provider for Scott Brown as the midfielder scored the only goal of the game against Cowdenbeath two minutes before the break. Clyde's top scorer, David Goodwillie, scored his second goal in two games since returning from a broken arm, the Scotland striker following up after a John Rankin shot was blocked after 19 minutes in Stirling. The Bully Wee are now unbeaten in 15 games. Tommy Muir headed Annan, who are not unbeaten in six games, into a half-time lead in Berwick and Kyle Bradley fired them further ahead with 17 minutes remaining. Calum Adamson gave the home side hope five minutes later, but the Wee Rangers could not find an equaliser as they slumped to a seventh consecutive loss in a run of 12 without a win.Elgin had to come back from two goals down to draw with Queen's Park. Lewis Hawke opened the scoring six minutes after the break and set up Kieran Moore for the second. However, Stephen Bronsky's close-range finish eight minutes from time and Darryl McHardy's drive three minutes later secured a draw for the home side, who are now unbeaten in five games.